This system is a fusion of our parking systems and our industry leading backup camera system. This system includes a 3.5-inch screen and flush mounted bumper backup camera. It also includes a sensor system that works like our classic SKU2830325 but is integrated with the backup camera system. This system is available in either a 4 or 8 sensor version depending on whether you want protection on one or both sides of your vehicle. When you put your vehicle in reverse the speaker will start to beep when there is something 8ft away and the beeping will get faster the closer you get to an object until it “flatlines” 6-inches from your bumper with a solid beep. The TadiBrothers radar technology had been used on the road for over 10 years from a small Ford Focus to large semi-trailers, we keep everyone safe. Please note, you can upgrade this system to be wireless or get a wider field of view for the camera by looking at our “customize and upgrade” section at the top right of the page. You get 4 sensors and a display along with enough cable for even the longest SUVs. Very easy to install and it comes with everything needed. The sensors are also painted with a high quality car paint that will stand in all weather conditions and it will look great installed on your bumper. All TadiBrothers gear is made by a factory specifically FOR TadiBrothers. Nobody else sells these models. Don't buy the knockoffs. "I recently bought a Fiat, it did not come with the back up camera and it was necessary that I get one, after purchasing the vehicle I was limited on funds so I purchased this monitor to go with a camera I had previously purchased. I was unsure if it would hook up to this unit, after discussing this with your customer service they got me the correct adapter and now it works perfectly. No distortion, can adjust the brightness and hue to my convenience, I am happy with this investment and would recommend this to my family and friends." "Recently I purchased your motorcycle system with the 3.5" monitor, I was weary about if I would be able to view this however once I got this up and running this is as clear as it can get, I can see it when I'm haulin' down the highway or if i'm backing up, it has helped saved me a few different incidents that if I didn't have this monitor and camera I might no be typin' this review. 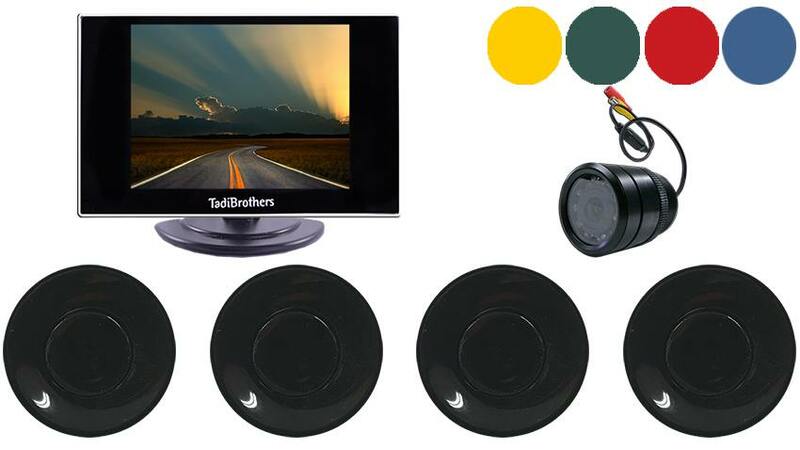 Great monitor and is perfect for any motorcycle and bike." "I drive mazda miata and I needed to get a back up camera because I've backed into a few things. I had no room on my dash for a monitor, I didn't want the mirror monitor because it's a convertible and wanted as small of a monitor as possible. I was afraid it might be a little too small but 8 months later I am still as happy as when I first purchased it, the picture is clear and it doesn't obstruct my view. Your customer service was very helpful to me getting this system activated, I have recommended you to a couple of my girlfriends because this is going to save endless amounts of incidents that would have happened without this camera, one of the best investments I have ever made." "Got this as a gift for my Mini. Had it professionally installed with the Wireless camera from tadibrthers and very happy with the picture quality and the way it works"